BIO— Originally from the small town of Williamsport, Pennsylvania, Cimini first studied fine art at the San Francisco Art Institute and eventually moved back east to study at the School of Visual Arts in New York City. He wrestled with various art forms from wood constructed sculpture to conceptual environments before landing on abstract painting something he loved from an early age. In 1994, he began developing the vocabulary for his current work, which originates from the linear landscape of Manhattan. It has since mutated to geometric spaces and their relationships to each other while still adhering to its architectural origins. His fascination with the mystery of color is also a vital aspect of his work. ARTIST STATEMENT— Building on the architectural origins which have been the basis of my work for over a decade, I have started referring to my compositions as random symmetry. That is, creating a balance on the canvas with no discernible pattern allowing a symmetrical, meditative composition to emerge. I employ the golden mean as a reference which can often be seen in the composition. I use oil paint with a cold wax medium, layering the paint, as organic surfaces evolve within the restrained lines of the composition. During the process an environment develops giving an emotional story to the thoughtfully planned out compositions. My color choices vary, sometimes deliberating creating a series with particular color decisions and sometimes allowing the color choices to impulsively appear fueled by intuition and experience. Color remains a constantly unfolding mystery. My fine art education is from east coast and west coast schools, studying at the San Francisco Art Institute in California and School of Visual Arts in New York City. I must say that most of my learning has come from the 20 plus years of my commitment to painting. Finalist in Painting for The Global Art Awards 2017 held at the Armani Hotel Dubai, Burj Khalifa. 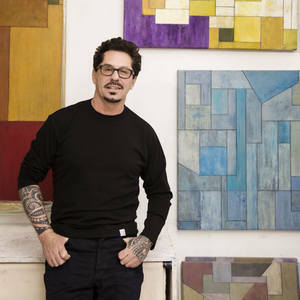 Cimini’s work is held in private collections worldwide as well as numerous corporate collections throughout the United States, including Coca Cola Bottling Co., Novartis Pharmaceuticals, Wells Fargo Bank, Bayer Healthcare and prominent law firms and corporations in Texas and Denver CO and New York, NY. THE OTHER ART FAIR NEW YORK (November 2018) Presented by Saatchi Art. THE OTHER ART FAIR NEW YORK (MAY 2018) Presented by Saatchi Art. THE OTHER ART FAIR NEW YORK (NOVEMBER 2017) Presented by Saatchi Art.